The Rev. Dane Radecki ’72 had to resolve his own reservations before agreeing to become the seventh abbot of the Norbertine Community of St. Norbert Abbey, he tells Mike Dauplaise ’84. As election discussions progressed, the veteran administrator recognized that the community valued his skills in organizational troubleshooting, and that soon his short tenure as pastor of Holy Cross Parish would make way for new service. Was becoming abbot ever part of your plan? This is not something you plan for. This was simply the outcome of a community of men who came together in three meetings to discern what our mission would be going forward; to identify the strengths and weaknesses we have as a community; and finally to discuss the qualities of what we’re looking for in the next abbot. How did that process play out? My ears were open. A small number of people, one by one, would talk to me about this. You can’t dismiss it as much as listen and come to your own discernment whether to say yes or no. Those sessions made a difference in being able to say yes. I had self-doubt. I recognized that bringing a skill set to an organization is one thing, but bringing it home is entirely different. This is very different because you live with the people; you don’t just work with the people. And when your election was confirmed? I was very humbled, because I really thought when I came [to Holy Cross], that this was it. I thought this was where I would have a place to exercise my pastoral skills in a focused way, unlike most of my other leadership roles. But as the abbot, I am a pastor in a sense. I am pastor of the community. What issues are on your plate with regard to the community’s mission? We will look at three things: What are we doing, how are we doing it, and who can do it? Looking at the future means preparing some of our young men to fill critical positions because some of our members are near retirement. Vocation emphasis is one of the things we’ll be working on. We are discussing implementing a policy we already have to provide a live-in experience. We see this as a good discernment experience for those not ready to make a full commitment. As we visit today, you are holding dual roles as pastor of Holy Cross as well as abbot. Right now it’s overwhelming, but it’s not a bad overwhelm. I’m starting to realize what the guys want done while also being enthusiastic about the things we have going on [at Holy Cross]. I’m also dealing with issues within my own family. We have transitioned my dad to assisted living, and my mother is now living at the abbey as we look for a longer-term solution. I have a brother and sister who are immensely helpful, but this is another piece to the present busyness. Holy Cross is in the midst of a major fundraising effort. Is it difficult to separate from that? I am a person who likes to be engaged in the future, in planning, and then seeing those plans fulfilled even when there are challenges. What makes the transition easier is I sensed the guys want to move our community forward and not just settle in. That connects with who I am and what I can contribute. Had it been the other way around, I don’t know what I would have done. But then I would not have been who they were looking for. The Rev. Dane Radecki ’72 had built a solid reputation throughout northeast Wisconsin as a respected leader capable of making difficult decisions, prior to his election as abbot. The 1967 graduate of Premontre High School in Green Bay became the first principal of Notre Dame Academy, which in 1990 combined the three Catholic high schools in the metro area. He was named president in 1993. Radecki joined St. Norbert College in 1999 as assistant to the president of the college for mission and heritage, and in 2001 was appointed vice president of mission and heritage, and pastor of SNC Parish. 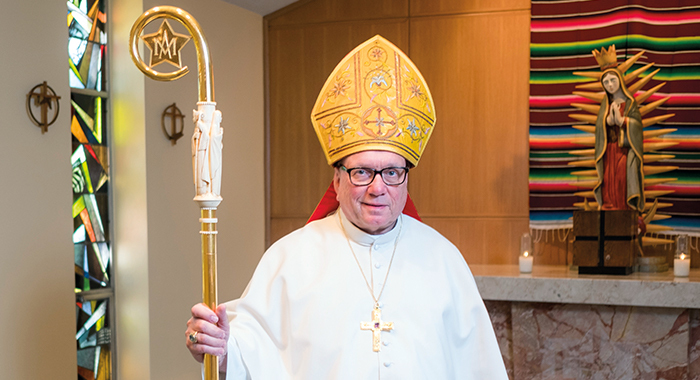 He returned to Notre Dame Academy as president in 2005, then was appointed pastor of St. Agnes Parish in Green Bay in 2010, and in 2012 was named president of the Green Bay Area Catholic Education system (GRACE). 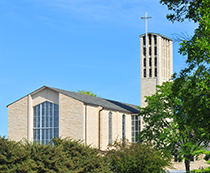 He was named temporary administrator of St. Mary of the Immaculate Conception Parish in Greenville, Wis., in 2016, and most recently became pastor of Holy Cross Parish in Green Bay in 2017.